THE call for a Punjab bandh on Tuesday signifies deterioration in the situation in the state following the standoff between Dera Sacha Sauda and the Sikhs. The regret the Dera chief made within the three days’ time given to him by the Sikh priests provided some elbowroom to end the standoff but Akal Takht wants unqualified apology. Efforts to find a way-out should not be given up even now. China is likely to be annoyed, but India’s “no” to its proposal for lifting the ban on trade in tiger parts is a step in the right direction. Many of the tigers are killed mercilessly because their body parts are used in Chinese traditional medicine. If China is keen on facilitating its industry, India has to bother about alarmingly dwindling tiger population. The world community is with India on this issue. Four Left leaders, including Mr Prakash Karat of the CPM and Mr A. B. Bardhan of the CPI, have opposed the pension fund regulator’s move to run the pension scheme by appointing fund managers. The Leftists, however, want the funds to be parked with the organisation managing the employees’ provident fund until the new pension scheme is finalised. The scheme became operational on January 1, 2004, and 19 states, barring the Left-ruled, have approved of it. It was a famous victory, but the question before Ms Mayawati, savouring her triumph in Uttar Pradesh after securing an absolute majority in the assembly elections, is: what next? Can she give her state a distinctly superior government than she and her predecessors have given in coalitions. That will determine her staying power and whether she can replicate her success elsewhere in the country. My heart really goes out to the plight of poor MPs of this country. Often a few of these hapless souls have been known to indulge in extra-curricular activities like human trafficking, cash for query and similar exercises to earn a few extra bucks to keep hearth and homes warm and kitchen fires burning. When Y S Rajasekhar Reddy took over the reins of Andhra Pradesh, he carried a tag of “perpetual dissident” for plotting against the successive Congress chief ministers in the past.Three years into office, Reddy, a medical doctor turned politician, is now getting a taste of his own medicine. The rumblings of dissidence within the party are growing louder by the day. Europe is undergoing its most dramatic changing of the guard in more than a decade. New leaders in the European Union’s three preeminent countries — Britain, France and Germany — not only may transform their nations individually but also have the collective clout to blast Europe out of its lethargy and revitalize it as a global and diplomatic powerhouse. With the prestige of Rahul Gandhi at stake, the Congress has begun a review of its dismal performance in the UP assembly poll.The party, which came off worse both in the number of seats and percentage of votes compared to the last assembly poll, has a long way to go in the state. THE call for a Punjab bandh on Tuesday signifies deterioration in the situation in the state following the standoff between Dera Sacha Sauda and the Sikhs. The regret the Dera chief made within the three days’ time given to him by the Sikh priests provided some elbowroom to end the standoff but Akal Takht wants unqualified apology. Efforts to find a way-out should not be given up even now. Hopefully, the bandh will pass off peacefully and deny the hardliners an opportunity to exploit the situation. However, not everybody is unhappy with the turn of events. The hardliners on both sides of the divide would favour a confrontation and they would do everything possible to achieve their objective. Needless to say, it is they who have to be kept in check in the days to come. After all, it was a clash between the Nirankaris and the Sikhs that paved the way for a decade-long phase of terrorism when people of all communities suffered at the hands of the wielders of gun. The hardliners are definitely hyperactive at the ground level to give a nasty direction to the fight. They are the ones who would like to have the deras closed at any cost and would like to have provocative advertisements released to the Press. They need to be kept on the leash if the situation is not to go out of control. Nobody would have expected the Akali Dal-BJP government to face such a crisis even before its honeymoon period is over. There can be differences of opinion on whether the government acted with the necessary determination and promptness when the flare-up first occurred in Bathinda. That it took several days to register a case against the Dera chief does not show the government in a good light. Whatever be its lapses, it cannot afford to be lenient to those who take the law into their own hands and the hardliners who are waiting to fish in troubled waters. If Chief Minister Parkash Singh Badal is unable to control the hardliners, it can even put the Akali Dal-BJP coalition under severe strain. The administration should not only be decisive but also appear to be tough with various militant groups who are raising their head. What is true about the Punjab government is also true about the Haryana government, which will have to take deterrent action against those who itch for a confrontation that will do no good to anyone except the hardliners. An immediate worry for the Badal government is to ensure that the bandh passes off peacefully. China is likely to be annoyed, but India’s “no” to its proposal for lifting the ban on trade in tiger parts is a step in the right direction. Many of the tigers are killed mercilessly because their body parts are used in Chinese traditional medicine. If China is keen on facilitating its industry, India has to bother about alarmingly dwindling tiger population. The world community is with India on this issue. The problem is that the tigers are being targeted not only because of the demand in China. Their skin, teeth and nails are valued all over the world and fetch astronomical prices. Their meat is also considered a delicacy. That is why smugglers are ready to risk their lives to fell the magnificent cat. With big money in question, even some forest officials tend to side with the poachers than with the magnificent animals and the laws to protect them. The maddening march of modernisation too has been the bane of all wild animals. The human beings have yet to learn to live in harmony with nature. That is why Project Tiger has been a failure. The project has helped increase the number of Bengal Tigers from 1200 in the 1970s to 3,500 in 1990s but far more needs to be done. At the turn of the century, India was home to nearly 40,000 tigers. Gir lions share the fate of their cousins. Recently, as many as 18 lions died in the Gir Wildlife Sanctuary and surrounding forests. Nearly half of the deaths were due to poaching. Whatever the causes, the harsh fact is that the lions and tigers are on the verge of extinction. There have been too many discussions. What is needed is worthwhile action. If tigers cannot be safe even in protected areas, they have no other place left to call their own. Four Left leaders, including Mr Prakash Karat of the CPM and Mr A. B. Bardhan of the CPI, have opposed the pension fund regulator’s move to run the pension scheme by appointing fund managers. The Leftists, however, want the funds to be parked with the organisation managing the employees’ provident fund until the new pension scheme is finalised. The scheme became operational on January 1, 2004, and 19 states, barring the Left-ruled, have approved of it. With the Leftists blocking the way, the pension Bill has got stuck in Parliament. The Centre had approached pro-reform West Bengal Chief Minister Buddhadeb Bhattacharjee for lifting the blockade, but all in vain. The Leftists have three main objections. One, the pension funds should not be invested in stocks. Under the scheme only 5 per cent of the pension funds can be put in bourses, that too as per the regulator’s guidelines. The remaining 95 per cent will be invested in government securities and bonds, where returns are assured. Two, the Leftists insist the pension funds should be managed by public sector money managers. They seem to have forgotten what the government managers had done to the investors’ money managed by the government-owned UTI. The Centre had to twice rescue the UTI from assured bankruptcy. Third, the comrades demand a government guarantee to pay the employees pension equal to at least 50 per cent of the average of the previous three years’ salary. If the funds do not fetch enough returns, the government should meet the shortfall. The government, on the other hand, pleads helpless to bear the growing pension burden, which is estimated to touch Rs101,000 crore next year. As the government and the Leftist conciliation efforts have borne no fruit, the huge funds collected under the new scheme remain unused, which means no returns and lower pension for employees when they retire. The Left needs to review their policy in case they want to help the employees more. Ms Mayawati's victory has made political pundits and practising politicians alike sit up. Her success was determined in part by her variation of the traditional Congress rainbow coalition built on her core support of Dalits. She had been foreshadowing a dramatic change in her rhetoric leading to the elections and fully grasped the banner of tolerance in the campaign. As the inheritor of the independence movement, the Congress once boasted of an enviable grassroots organisation. In fact, the party had become so proficient in winning elections that the organisation ran like a well-oiled machine. But the long years of rule and Indira Gandhi's contest with her organisation men to claim supremacy starved the roots. The two splits in the party meant that wheeler-dealers were favoured to committed party men and women and the short "extra-constitutional rule" of son Sanjay drove many traditional workers away. Over the decades, the Congress increasingly lost the plot in the Hindi heartland and elsewhere as regional parties stressed their sub-nationalism (as in Tamil Nadu) and cobbled together caste and other combinations to achieve power. The Communists have not been able to spread their wings outside West Bengal, Tripura and Kerala. The Bharatiya Janata Party sedulously cultivated its constituency to team up with anyone it could to stake its claim. But the manner in which Ms Mayawati has swooped to victory has added a new ingredient to the political mix.It is, of course, true that no one part of the country is quite like another. At the same time, the Congress showed time and again that its rainbow formula was viable in large swaths of the country. It could not continue to work because of the party's own splits and compulsions and the "Mandalisation" of the nation. The rise, in particular, of the Other Backward Classes was at once a tribute to the ability of democracy to empower a people and a sign of increasing fragmentation. The Congress formula could no longer work because the OBCs acquired a taste of power and did not need the Congress crutch and Muslims, another component, became increasingly disillusioned and preferred to shop among parties to get the best deal. The Dalits were lost to the Congress as they threw up their own leaders and parties and factions, until the far-sighted Kanshi Ram had the ability to weld a large part of the Dalit vote into an increasingly effective political party. It was Ms Mayavati's genius to build a broader base on the Dalit core because she realised that Dalits alone could not hope to achieve power. There are indications that Mr Nitish Kumar, the JD(U) Bihar Chief Minister, has recognised that to retain power in the medium to long term, there is no substitute for development and pulling the people out of misery and poverty. Large parts of UP are as poor and under-developed as Bihar and Ms Mayawati has her work cut out in pursuing policies that will help the most disadvantaged and spread development projects across the state. After effecting a wholesale transfer of officers, Ms Mayawati has framed rules for such transfers, which are the bane of good administration and disruptive of development goals. Second, she has suggested that the poor among the higher castes should also be entitled for help. The jury is still out on whether she will keep her word and on the other equally important plank of curbing corruption, a number of her victorious party colleagues are corruption-scarred, inasmuch as they are facing criminal charges. However broken a reed Ms Mayawati turns out to be, there is optimism in the air because the political community is seeking answers in a discouraging environment. The Congress seems not to be going too far as it keeps losing one state after another and there are few indications that, apart from using the family mantra, it has much new to offer. The people are not convinced that Mr Rahul Gandhi is the future, contrary to Prime Minister Manmohan Singh's assertion. The Bharatiya Janata Party seems to have come to the conclusion — witness the poisonous compact disc it sought to propagate in the UP election campaign — that when it finds itself in trouble, its salvation lies in Muslim-bashing, which it uses interchangeably with the Hindutva slogan. If the BJP's development goals were premised on its Gujarat philosophy, there would be little to distinguish it from fascism. Can Ms Mayawati be the harbinger of a new phase in Indian politics that will promote basically secular goals while seeking to uplift the poor and the downtrodden? It is a tall order but one worth attempting. With Indian industry and the services sector on a high, it has been suggested that they could look after themselves. Indeed, if the government does not do more to improve the lot of the poor in an era of escalating inequalities, the country can only look forward to social disorder and chaos.Ms Mayawati will probably go for the other states of the Hindi heartland in promoting her cause. Short of areas like Maharashtra, subject to factional quarrels among Dalits, she starts with the Dalit base. Surely, her UP victory will have enthused the Dalits in Delhi, Rajasthan and Madhya Pradesh to lend her greater support. Psychologically, they already feel empowered. The possibility of adding Muslims and higher castes will vary from area to area. Alluring as the prospect of projecting herself on the national plane is — she has made no secret of her prime ministerial ambitions — Ms Matawati will do well to concentrate on Uttar Pradesh. In common with Bihar and Orissa, UP has seen few benefits of development and good governance, with corruption and crime often going hand in hand. In the past, she has shown that she is capable of taking on dons when she wants to. She must now cast her net wider to take on the dons of her own party.Such tasks might prove too daunting for Ms Mayawati. But they certainly provide her an opportunity to prove her mettle. After all, what does an MP get, besides the monthly pay, which he hardly gets to spend, sprawling bunglow in the heart of the city and perks like free electricity, water, phone, travel, pension and loads of respect and sycophancy? And, of course, lakhs by the way of MPLAD, for which he has work hard for thinking ways and means of spending it the way he wants without raising uncomfortable queries from CAG and the media. But CAG and the media still continue to breathe down their innocent necks, alleging that a number of these poor MPs violate norms while using the MPLAD they gets for the uplift of their constituency. Now is this fair? Whenever he travels abroad, an MP is given free business class air tickets and gets paid a daily traveling allowance, depending on the country being visited. Now is this called life? Can a human being be really expected to make a decent living and be happy with just this much? A hue and cry has been raised after a couple of them were found “misusing” facilities like air travel and diplomatic perks for human trafficking. But what I humbly beg to submit is that unfortunately their social welfare gestures were misunderstood and these MPs branded bad and evil people. What the media and the general public do not know is that these kind-hearts were actually doing all this to decongest India and for the general good of the common Indian. Here are a few suggestions that these distressed individuals can use to make their lives little more comfortable (I am sure quite a few might already be following them). An MP gets a nice big bungalow in the heart of New Delhi for which he pays whopping Rs 2,000. The bunglow is furnished with air-conditioners, refrigerators and television sets, all free of cost. The maintenance of the house, including washing of sofa covers and curtains, is also done free of cost by the government. So, it is in such pathetic conditions that an MP has to live till the time he is booted out by the public. Now all these free goodies can be used to keep paying guests while sprawling lawns can be rented out for private parties, marriages etc. This way he can earn a few extra bucks to keep the fire in the kitchen (how moving) burning. Another thing what he can do is to set up PCOs with the help of three free phone lines and, believe it or not, 1,70,000 free call entitlement every year. He can also extend the free medical expenses to well paying patients, sell free office stationary and other items and use official cars as taxis. I want to continue with the sad story of their other counterparts, MLAs for example, but my eyes are too full of tears to write any further. When Y S Rajasekhar Reddy took over the reins of Andhra Pradesh, he carried a tag of “perpetual dissident” for plotting against the successive Congress chief ministers in the past. Three years into office, Reddy, a medical doctor turned politician, is now getting a taste of his own medicine. The rumblings of dissidence within the party are growing louder by the day. Though not on the scale that used to be the bane of the Congress in the past, internal squabbles are beginning to dent the image of the government. The dissidence has gathered momentum after Reddy carried out his first Cabinet expansion last month that left out several ministerial hopefuls. While some leaders like city MLA P Janardhan Reddy, a bitter critic of YSR, and MP V Hanumantha Rao have been criticising the government for long, they are now joined by some more disgruntled elements. Former minister and Dalit leader P Shankar Rao, who could not make it to the Cabinet, has been the most vociferous of them, attacking the Chief Minister for his “autocratic style of functioning”. He has since been issued a show-cause notice by the party for his outbursts. The party MPs G Venkataswamy and Madhu Yashki Goud have also been publicly criticising the Chief Minister on various issues. 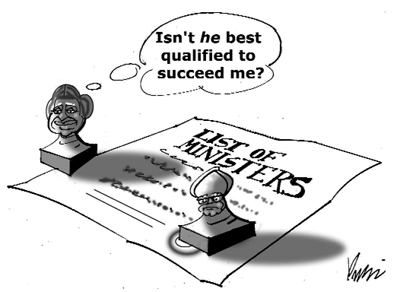 Adding to his woes, four senior legislators and aspirants for Cabinet berth have turned down the posts of Chairman of the newly created regional development boards. The simmering discontent burst into the open at the party’s “Re-dedication Day”, held here on May 14 to mark the completion of three years in office, when Janardhan Reddy, who was the party’s floor leader in the Assembly between 1994 and 1999, made a no-holds-barred attack on YSR in the presence of AICC General Secretary in-charge of AP Digvijay Singh and even demanded the creation of Deputy Chief Minister’s post. As YSR enters the fourth year in office, he is saddled with a plethora of problems, both internal and external. While dissident activity in the party can only get worse as the elections approach, the growing aggression of the main opposition TDP is set to compound the problems. The TDP, led by N Chandrababu Naidu, has stepped up its campaign against the Congress government on a string of issues, including corruption, irregularities in irrigation works, land scandals, absence of control over the administration, agrarian crisis and the alleged land encroachments by members of the Chief Minister’s family. “YSR is converting the state into a family fiefdom. He and his close relatives are out to plunder the state’s wealth, grab lands and eliminate political rivals. There is a total collapse of administration. It is a goonda raj,” Naidu said. His party had released a 48-page “charge sheet” on the three-year Congress rule, listing out its acts of omission and commission. The exit of Telangana Rashtra Samithi from the UPA coalition will further aggravate the political challenges for YSR. As the 2009 elections hold the key to the future of the Telangana movement, the TRS is bound to flare up statehood sentiments and focus on the Congress “betrayal” of the Telangana cause. For YSR, who had acquired a pro-farmer and pro-poor image and steered the party to a stupendous victory on the crest of a populist wave, the three-year rule has been a mixed bag of successes and setbacks. By and large, he has been able to keep up the key poll promises like free power to farmers, revival of the rural economy by according top priority to agriculture and irrigation, low-cost loans to self-help groups, massive housing for the poor and distribution of lands to the landless poor. However, the results have been far from satisfactory. Despite the supply of free power, waiver of power dues and an attractive package of incentives, there has been no let-up in farmers’ suicides. “Since this government came to power, over 4,100 farmers have taken their lives as the government has failed to come to their rescue. Power supply has become erratic and there are no remunerative prices for agricultural produce. Farmers are being driven out of their lands in the name of development,” Naidu said. An ambitious “Jalayagnam” programme, aimed at providing irrigation facility to an additional one crore acres at a cost of Rs 75,000 crore over five years, is bogged down by allegations of massive corruption in awarding contracts, projects estimates and land acquisition, besides inter-state disputes and legal hurdles. Though YSR sought to project himself as a “modern-day Vinoba Bhave” by surrendering 930 acres of assigned land owned by his family members in his native Kadapa district, the strategy had backfired with the opposition targeting him for violation of several land laws and seeking his prosecution. The land deals involving YSR, his son Y S Jaganmohan Reddy and other family members have become the prime targets of the opposition attack. His government’s decision to allot 487 acres of land to a cement company in which his son Jaganmohan Reddy is a director had sparked a political controversy. Like several other orders, the government withdrew this decision in the wake of criticism from various quarters. The Chief Minister had raised hopes of finding a peaceful solution to the decades-old problem of extremism when he initiated the first-ever direct talks with Maoist groups. But, the dialogue process had collapsed after first round of talks. The alleged mishandling of the now-shelved Volkswagen car project, the question mark over the ambitious FAB City project and the legal quagmire surrounding Muslim reservation policy have sullied the image of the YSR government. “They could get the European heart beating again,” said Francois Heisbourg, a foreign policy analyst at the Foundation for Strategic Research in Paris. All three new European leaders are replacing predecessors who had become national and international liabilities. Nicolas Sarkozy, 52, took over the presidency of France on Wednesday from septuagenarian Jacques Chirac, who served 12 years. Gordon Brown, 56, will become prime minister of Britain on June 27 when Tony Blair leaves after 10 years. And Angela Merkel, 53, was named chancellor of Germany in 2005, after Gerhard Schroeder’s seven years in power. The new axis of leaders is expected to moderate Europe’s relationship with the United States, striking a more even-handed tone than the emotionalism of Blair’s perceived subservience or Chirac’s hostility, many analysts here say. In this view, a new U.S. president in less than two years could work with a more united, engaged Europe to leverage Middle East peace efforts, persuade Iran to curtail its nuclear ambitions and negotiate with Russia over contentious energy issues. In recent years, the divided capitals of Europe and the go-it-alone foreign policy of the Bush administration aggravated rather than quelled some of the globe’s most dangerous conflicts and disputes, many Europeans believe. European officials and analysts also anticipate the new leadership trio will try to curb — at least initially — the intramural bickering of their predecessors that paralyzed the 27-member European Union as a cohesive, influential player on the international diplomatic stage. But to achieve a new dynamism, Europe must first resolve its internal disputes. The defeat of the E.U. constitution two years ago in France and the Netherlands and both weariness and wariness over the rapid expansion from 15 to 27 countries in less than three years prompted European Commission President Jose Manuel Barroso to call for a “pause” to reassess the union’s future. The pause morphed into a standstill until Germany took over the rotating E.U. presidency and used it as an opportunity to try to jump-start the moribund constitution, the document meant to bind 27 disparate countries into a powerful bloc with the potential to address a globalized world in a single voice. Despite Sarkozy’s personal support of a leaner treaty, he and other European leaders still must convince their Euro-skeptic constituencies that they should accept a document they won’t have the chance to vote on. The 18 countries that have approved the constitution are fighting to preserve much of the original document. Many politicians and political analysts note that there already are some sharp differences among the three leaders and that two — Sarkozy and Brown — are largely untested as stewards of their countries’ full foreign policies. Sarkozy, in particular, has a confrontational style. In contrast, Merkel, a former East German physicist, has quickly earned an international reputation for an unpretentious, conciliatory style that sometimes includes rearranging the seating at meetings where heads of government are arguing. Some analysts blame European equivocation in part for the current civil unrest and demonstrations against Turkey’s Islamic-leaning government. With the prestige of Rahul Gandhi at stake, the Congress has begun a review of its dismal performance in the UP assembly poll. The party, which came off worse both in the number of seats and percentage of votes compared to the last assembly poll, has a long way to go in the state. While there is no Muslim among the party’s 22 winners, the number of candidates finishing second has gone down from 27 last time to 23 now. The gap between the winners and the Congress candidates has been substantial in a large number of seats with over half of the contestants left behind by margins of over 25,000 votes. Congress president Sonia Gandhi and her son are expected to monitor the party’s plan. The DMK’s Radhika Selvi, specially handpicked by M Karunanidhi to be a member of the Union council of ministers is a gangster’s widow. An MP from Tiruchendur, 31-year-old Selvi has studied only up to class X and mentions in her profile that she is a javelin thrower and a kabaddi player. Observers chuckle at the contrast with Harvard-trained Dayanidhi Maran. In 2001 Selvi married Pannayar Venkatesh, a gangster. When Karunanidhi announced Selvi’s name, many ministers failed to place her. This was particularly so as Selvi preferred being a back-bencher in the Lok Sabha. In September 2003, Venkatesh, who hailed from a Nadar family, was dragged out of his flat and killed by the police even as a pregnant Selvi and neighbours watched in horror. Clearly, Karunanidhi is trying to assuage the feelings of the Nadar community. The recent conference on “empowerment of SCs, STs and minorities through elementary education” threw up some questions that the government would need to address in the near future. Lok Sabha Deputy Speaker Charanjit Singh Atwal drew the attention of the assembled leaders, including Vice-President Bhairon Singh Shekhawat and UPA chairperson Sonia Gandhi, to the widely recognised gap in the quality of basic education for children from different strata of society. Foreign Secretary Shivshankar Menon is now firmly in saddle as India’s pointsperson on the Indo-US nuclear deal. The negotiations with the US on the 123 agreement are now being steered by Menon in conjunction with S Jaishanker, India’s envoy in Singapore. The Prime Minister’s Special Envoy Shyam Saran, who after his superannuation was appointed in the PMO exclusively for the nuclear deal, also continues to be in the loop for the time being. Grapevine has it that Saran may get another diplomatic assignment, perhaps as Secretary General of the Commonwealth.